The Metal Coatings are ground metal suspended in a non-toxic water based acrylic binder. They may be applied to both metal and non-metal surfaces such as glass, wood, ceramics, concrete, foam, and resin. All of the Dye-Oxide Patinas, Universal Patinas, Vista Patinas, Solvent Dyes, Patina Stains, and Finishing Waxes work well with the Metal Coatings allowing endless possibilities for finishes. Among the Traditional Patinas, Liver of Sulfur (brown) and Tiffany (green) patinas work the best with the Metal Coatings. The Metal Coatings are very durable outside (10 to 15 years) and are non-hazardous. One Gallon of Metal Coating will cover 100 square feet (this includes the recommended two layers). 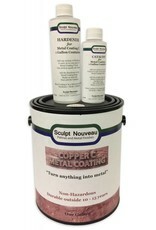 The Metal Coatings are available in two different formulas - B and C. Patinas may be applied to both whether wet or dry. Once dry, either may be burnished with steel wool in order to highlight or adjust the patina. Additionally, more patina may be added after burnishing. Type C contains more metal than Type B and dries hard enough to be polished with a polishing wheel. Type C comes bundled with a catalyst and hardener. When applying the Metal Coatings to ferrous metals (iron, steel, and aluminum), a primer must be used to protect the underlying metal.